September 2018 – OVVO is proud to present its new Gold & Hue Collection, with a distinctive style for both men and women. The technical precision of European manufacturing and the luxury of pure gold combine to create a frame that offers the wearer an exquisite piece of handmade eyewear. A sweep of color along the brow line adds a striking, stylish finish. A leader in technological innovation, OVVO’s design team fuses the gold with a surgical steel and titanium composite, for exceptional durability. 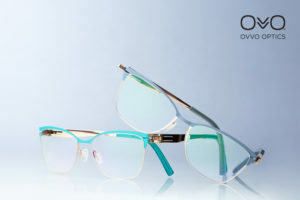 Every pair of frames features OVVO’s patented screwless hinge, for flexible, lightweight construction, and comfortable everyday wear. Accessible luxury at its finest, the frames are set in 14kt gold with four colors per style. The women’s style is offered in sea foam, crimson, powder gray and boysenberry. The men’s style comes in black, deep sea, taupe, and raisin. 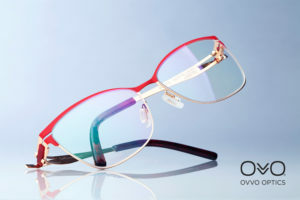 Each pair of frames features a contemporary take on retro-inspired silhouettes: the women’s style is smart yet sultry, with a 50s-inspired cat-eye silhouette and subtle flair. The men’s style is a bookish and luxurious take on the classic rectangular frame, with exaggerated lines and angles inspired by the masculine, aerodynamic look of a Ferrari or Lamborghini sports car.